As you may have figured out from the bulbous figure pictured in the blog header I am pregnant. I have been pregnant for one hundred years. It's true. I'm a record breaker! Okay obviously I am no record breaker just a liar. In my defense I do feel like it has been a hundred years. My son is a year old so it has been awhile but this is it for us. We are done having children...for a very long time. My husband keeps asking me if I would like to use the maternity pillow that I was in love with last year but I haven't needed it. I have finally grown accustomed to sleeping on my side due to nine months of pregnancy followed by six months of nighttime breastfeeding and in addition co-sleeping for the past year.It is great that I can finally sleep on my side but I miss sleeping on my stomach so much. It seems like such a small simple thing but I absolutely cannot wait until I am able to do it again. Someday. I am experiencing some breathing issues. I feel out of breath often and that can be uncomfortable but besides that everything is great. Of course it would be fabulous to lounge around all day snuggling the baby in bed but he is a very busy little guy these days and would rather wreak havoc around the house. Besides that I have work and household responsibilities to keep up with lest I get fired and end up with a condemned hoarders type home. I don't have any interesting crazy pregnant lady stories to share this week which is shocking. I did almost stab my husband because he walked on my freshly mopped and no yet dry kitchen floor with socks on but I cannot blame hormones on that. I am a crazy person that takes mopping VERY seriously and that would have made me flip out pre-pregnancy. 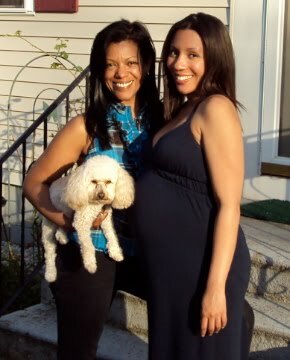 My mother & me during last year's pregnancy. I told you I have been pregnant forever!